There are all sorts of speculation in the cooking world and ideas. As we know, almost every year the qualities of each cooking instrument are updated, making them easier to use, more efficient, save time, even cook in less oil, healthier, etc. Let’s find out why few people prefer to use instant pots, instead of the standard pots. What are the advantages and disadvantages of using a pressure cooker? The difference between cooking in a regular pot and cooking in a pressure cooker. Safety tips to keep in mind when using a pressure cooker. Best pressure cookers to buy. Why is cooking in a pressure cooker considered healthy? A pressure cooker has the advantage of reducing cooking time, to three times faster than cooking in a regular pot. Moreover, this speed spoils neither the quality nor the taste of the food, and it even becomes tastier. This type of pan is especially recommended for recipes that require longer cooking time like pulses, legumes, grains etc. One of the reasons people avoid using a pressure cooker is its past reputation of bursting. Well, the modern day improved versions of pressure cookers like the instant pot are designed with safety features. So, you need not worry about a kitchen blast. The other reason is the requirement to follow cooking instructions to avoid over or under cooking the ingredients. Unlike a reqular pot, you are unable to remove lid and keep an eye on your meal. So for people used to manual controlled cooking, this fill set and hope for the best, way of cooking method may prove to be a bit challenging. However, the modern day pressure cookers and easy instructions take care of both the issues. All pressure cookers come in a package with detailed instructions for use and maybe even with a recipe booklet with recipes to cook in a pressure cooker. The cover valve must always be open, which means that the pot should never be filled completely up with food or water, otherwise, when boiling, it may ooze out of the nozzle. The boiling time of each meal and /or individual ingredient should be strictly respected, to retain all the vitamins, minerals and fibers of chicken beef and other food ingredients. Another essential element is that the pressure cooker works only on low heat and the whistle signals when the food is ready. Only lift the lid up, when the sound stops and all the steam is out. Look at this demo. We all want things that will last as long as possible. When it comes to buying pressure cookers it is important to take note of the material it is made from. A high-quality pressure cooker should be made of steel and the ebonite handle. Otherwise, you can even endanger your life. The standard pan is just as functional as a pressure cooker. Cooking in a regular pot is traditional in the sense that it’s easier to use because it does not need to follow a more significant number of instructions, you can just raise the lid and control your cooking. However, if you use such a pot, vitamins and essential minerals in food are not found in such a high percentage as they are found in the food cooked under pressure. So both versions can be used, but the improved version is healthier. 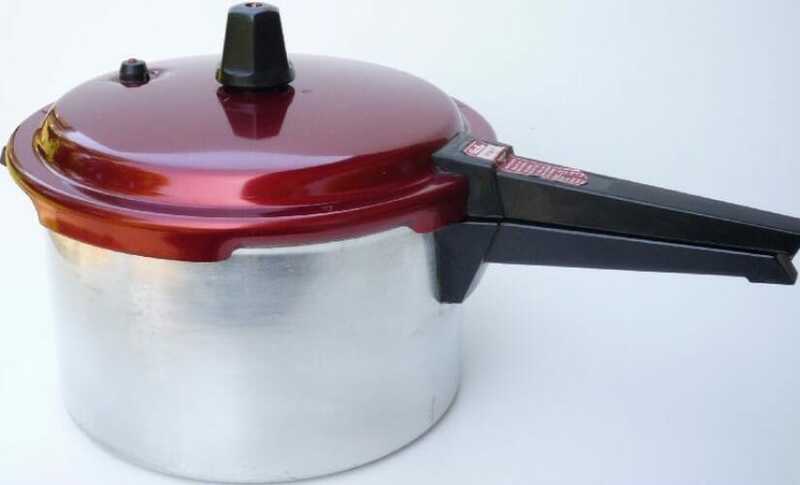 Even if several requirements are met, the pressure cooker is among the favorites of the cooks because it has the same qualities as the regular pot, but it comes with improvements that are crucial in the cooking world. Not only does it save a lot of time, but it is also healthy, and it tastes even more intense. Engaged in the rhythm of an increasingly alert life, we are forced to make the most of our time. Households have become a struggle against the timer, which is why most of them have suddenly discovered the utility and advantages of using home appliances that would not have been considered essential before. Among the innovations to make our kitchen time more efficient, is the pressure cooker. A handy utensil that offers not only the advantage of saving time but also the opportunity to cook diversely and healthily in record time, especially if you use an excellent electric cooker. Although we might think that the pressure cooker is a recent invention, there is evidence that it has been around for over 100 years. Initially called the “steam room,” the discovery belongs to a French physicist – Denis Papin, who manages to demonstrate that increased pressure can cause the temperature to rise beyond the standard boiling point. Moreover, the physicist also conceives the safety valve that prevents the accumulation of steam inside the container, to turn into an explosion. When using a regular dish, the boiling point or the baking of a meal cannot exceed 100 degrees Celsius. Do you have a pressure cooker or have cooked or tasted food cooked in a pressure cooker? What did you think about it and would you consider cooking in a pressure cooker. Share your thoughts or any questions here. I am not a pressure cooker person. Never have been. I like food really crispy – and I don’t believe cookers like this do that!